Tucson Daily Photo ~: Close your eyes! Unbelievable! Now that the monsoon season is here, I am delighted to share my favorite video for this time of year. I post this every year because it is truly one of the MOST amazing videos! You will just not believe your eyes and ears when you see and hear how this chorus creates a huge rain storm. Love it! Love it! Enjoy! 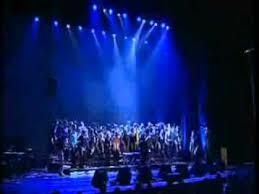 Thanks for posting this annual vocal tribute to the desert monsoon...extraordinary! So glad you've finally got RAIN! !